expect Fox's early superhero, The Flame, to have been a copy of Marvel's Human Torch. Actually, The Flame appeared a few months before the Torch's November, 1939 debut. Anyway, tho both used fire as a motif, The Flame had a different set of fire-related abilities. Gary Preston was only a baby when his father, a missionary in western China, was washed away in a flood. Fortunately, Dad was able to save his offspring by placing the boy in an apparently waterproof basket, and trusting fate not to let enough water spill in to sink it. The strategem worked, and the basket washed ashore in Tibet. According to clichés of the time, Tibet was chock full of magic and mysticism; and strange, inexplicable things happened there all the time. If anyone doubts this, consider the fact that floods usually carry things downhill, whereas Tibet is what everything around it is downhill from. Anyway, Gary grew up in one of those lamaseries that litter the Tibetan countryside. The lamas raised him to physical and mental perfection, and also taught him to exercise power over flame. He could make any fire in his vicinity flare up or die down, and control his own body temperature to the point where he could make bullets melt before reaching him — and never mind the fact that a liquid bullet strikes with the same kinetic energy as a solid one. Most useful of all, he could materialize out of any flame, even that of a match, and thus teleport pretty close to wherever he liked. When he'd mastered these abilities, he returned to the outside world and became a superhero. In that capacity, he carried a flame thrower the size of a handgun. It wasn't until 1941 that he started bursting into flame like the Torch. The Flame first appeared in Wonderworld Comics #3 (July, 1939). The title was a continuation of Wonder Comics, Fox's first release, where Wonder Man had presaged the opening of the superhero floodgate. Like Wonder Man, and many other early Fox comics, the contents had been created by the Eisner-Iger studio, source of Sheena, Blackhawk and much more. This particular story was written by Will Eisner (Doll Man, The Spirit) and drawn by Lou Fine (Uncle Sam, The Black Condor). The Flame went on to become one of Fox's biggest stars — in fact, one of the top three, as evidenced by his starring role in all seven issues (starting Fall, 1940) of Big 3, which he initially shared with The Blue Beetle and Samson. He also had his own comic for eight issues, starting Summer, 1940. He remained in Wonderworld until its final issue, #33, monopolizing its covers almost to the end. But public taste had barely begun turning against superheroes, when Fox abandoned The Flame. A half-hearted attempt to freshen him up was made in Wonderworld #30 (October, 1941) by adding a sidekick, Flame Girl, but it doesn't seem to have helped much. All three of his titles were extinguished with a January, 1942 cover date. In the 1950s, many of Fox's properties went to smaller publishers. 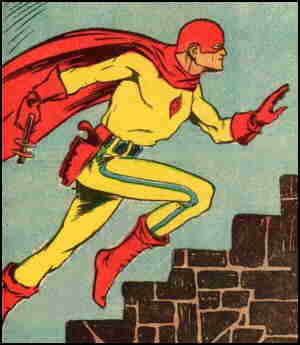 Robert Farrell, publisher of Ajax Comics, revived the concept of The Flame in 1954, with a new character by that name. But only three issues were published, and that was the end of him until AC Comics (Femforce), where most superheroes not protected by lawyers eventually wound up, inevitably revived him.